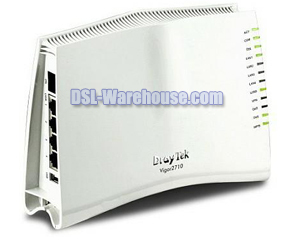 The DrayTek Vigor 2710 is a highly integrated ADSL2/2+ modem / router with VPN and Firewall capabilities specifically designed for SOHO (Small Office and Home Office) and residential broadband access requirements. The DrayTek Vigor 2710 is also an integrated network access device that not only offers rich functionality with up to 24Mbps bandwidth downstream, but also bandwidth management for multimedia applications. DrayTeks' 2710 series also incorporates a powerful firewall for protection against malicious Denial of Service (DoS) attacks. 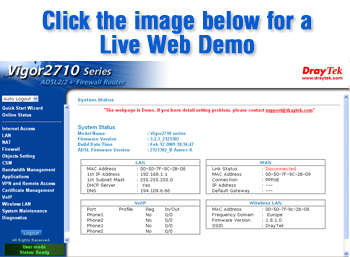 The Vigor2710 also includes more advanced security features such as Stateful Packet Inspection (SPI) ensuring network reliability by detecting attacks and prohibiting malicious penetrating packets from entering the internal network. 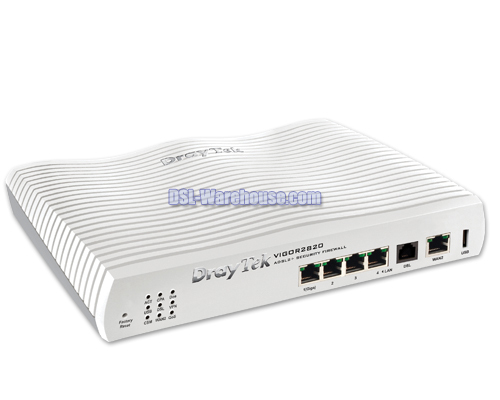 In addition, the DrayTek Vigor2710 has embedded VPN support for confidential remote access, and is equipped with powerful DES, and 3DES encryption engine, as well as automated key management via IKE to easily create 2 simultaneous VPN tunnels. The Vigor2710 has an easy-to-use CSM (Content Security Management) that can prevent / block the connection to Web sites that contain illegal or objectionable content. The use of bandwidth / session consuming Peer-to-Peer (P2P) applications can also be managed by embedded CSM. Need even more versatility?! Attach your USB storage device to the USB port of Vigor2710 to share files, or you can use a USB printer by connecting it to the 2710s USB port.